Mercedes Benz is the innovative company which brought us all to the future. This one company set the pace for what all cars would be made into since the first motorwagen was made in 1886. Mercedes Benz were the ones who created the crash testing program to ensure the protection and safety of drivers in the face of car accidents and were one of the first companies to build the supercharged engine in the 1920s. Sometimes even the best engines these days start to age. When using GO-15™ engine treatment on even the oldest Mercedes Benz vehicles, it could help you extend the life of your vehicle's engine. GO-15™ will give every Mercedes Benz vehicle the clean engine it needs. Our product is used for any vehicle no matter how old or new it is. GO-15™ helps keep metal parts in new running condition for long periods of time. For older vehicles, it will repair years of wear and tear that restores lost performance and efficiency. Our products work immediately after it is applied to your Mercedes Benz engine from cleaning the metal to helping get rid of contaminants that cause increased friction which is one of the main reasons for higher emissions when your car ages. GO-15™ works with every kind of petroleum and synthetic oils, greases, and hydraulic fluids. 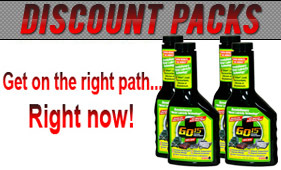 For every 5qt engine add 10oz of GO-15™ at every scheduled oil change. Wherever your oil goes so does GO-15™ where you can reap the rewards. After your first engine treatment it will take roughly 800 to 1,000 miles before you notice an increase in mpg. Continuing to re-treat your Mercedes Benz engine with GO-15™, 8 oz. after each oil change you will notice that you have increased your fuel economy from 15% to 20%. GO-15™ has improved a variety of engines from Mercedes Benz. Our customers were constantly satisfied with the GO-15™ engine treatment on their Mercedes Benz vehicles providing the best increases in miles per gallon and a longer life for several Mercedes Benz vehicles whether old or new. "I have been using Go 15 in my car for the past 7 years. My car is a 1988 Mercedes Benz 420 SEL. And, yes, it turned 25 years old this year. I had some engine work done in 2005 and started using Go 15 in 2007. My car runs beautifully! I have faithfully added Go 15 to all my oil changes in that time and my engine performs great. In fact, at this point, I am afraid to not add Go 15! What if my car doesn't run as well? I have never calculated whether or not I save 15% in fuel costs. I now live in Texas and everything is far away, so I fill up whenever. If it saves me on gas that's just great, but my main concern is keeping my car in top running form. And Go 15 has certainly done that. I have owned my car for 15 years now and the engine has the power it had when I first got it. Thank you Go 15! "